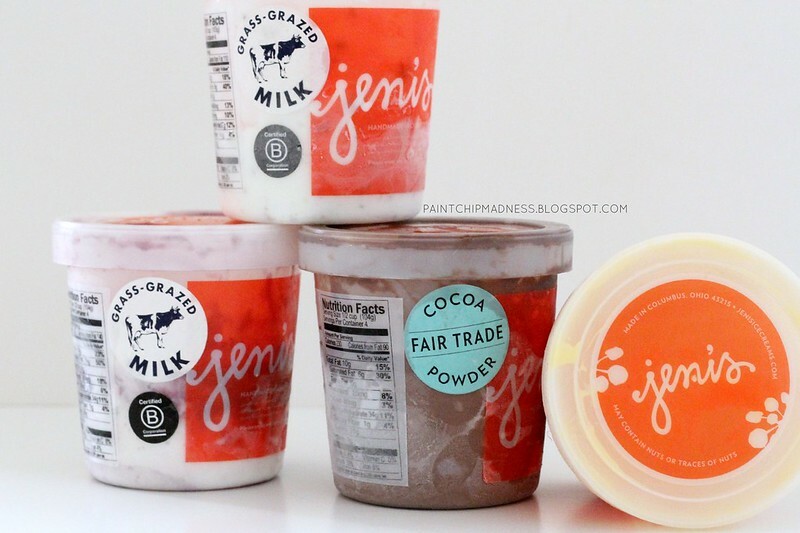 JENI'S ICE CREAM: SPLENDID INDEED. You know kind of present is hard to shop for? Parents' anniversaries. My parents are already hard to shop for (anyone else have this problem?) and getting surprise gifts for them is equally as hard. But here's when good old social media comes in handy. I'd seen Jeni's Ice Cream on an instagram account and had checked out one of their books from the library before, too. But seeing as they didn't have any store locations near me, I'd never actually tried any of their ice creams before. But that's when good old snail mail comes in handy. 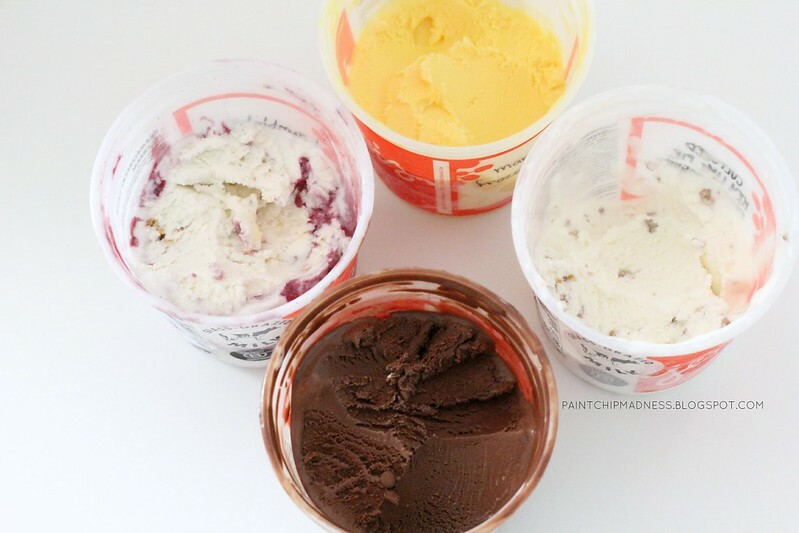 Did you know you can get ice cream in the mail? I mean, I know you could just hop in the car and drive to your local grocery store to pick some up, but there's a certain novelty and excitement about getting a box full of ice cream (and dry ice to keep it cold) delivered right to your doorstep. 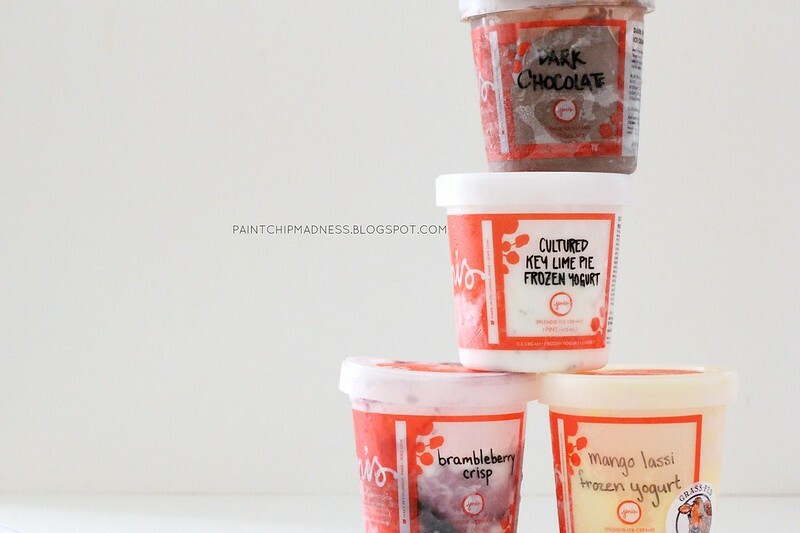 Especially when there are fun flavors and pretty packaging involved. My sisters and I all chipped in and bought four pints of ice cream (two ice cream and two frozen yogurt flavors) and I have to say, Jeni's is amazing. It's wayyy better than the store-bought varieties and the pints are packed with flavor and sweetness galore. I don't really have a sweet tooth, but this stuff made me want seconds and then thirds. 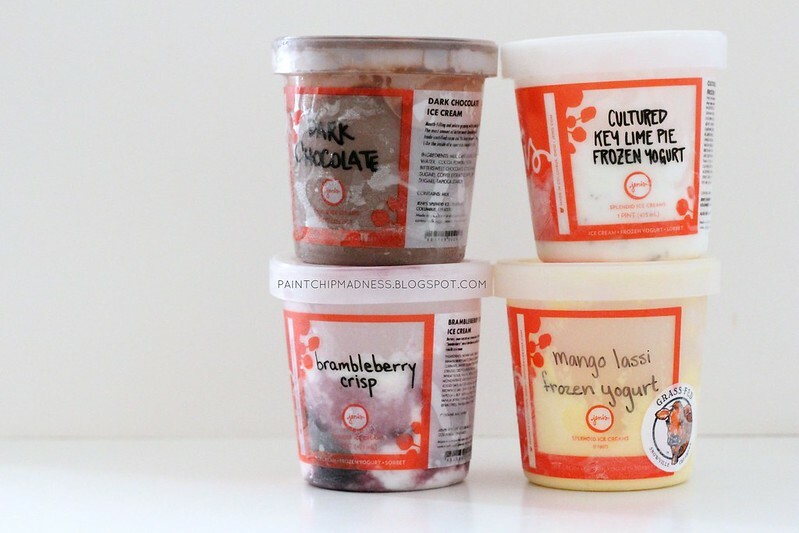 Being fruit lovers, we picked out Jeni's Brambleberry Crisp Ice Cream, Mango Lassi Frozen Yogurt, Cultured Key Lime Pie Frozen Yogurt, and Dark Chocolate Ice Cream, too. And if you ask me, they're all winners. I usually stray away from chocolate ice cream, but my sister and both agreed that this is the best chocolate ice cream we've ever tasted. And you can't go wrong with dark chocolate, right? We also loved the Brambleberry Crisp, too. I loved the brambleberry swirl and the bits of oat streusel swirled in was amazing, too. I personally love bits of pie crust or streusel mixed into my ice cream and so both the Brambleberry and the Key Lime Pie were--for lack of a better word--amazing. But both of the frozen yogurt flavors were the hands down winners in my house. The texture is rich and creamy with an intense (and real!) fruity flavor. You can tell it was a winner because they were the first to go and the ones we couldn't stop talking about, too. Oh, and how did my parents like it? Well, my mom told us it was the best anniversary present yet (I'm guessing our old handmade cards weren't nearly as good?). We've also all decided that we can't wait to have an excuse to order another shipment. 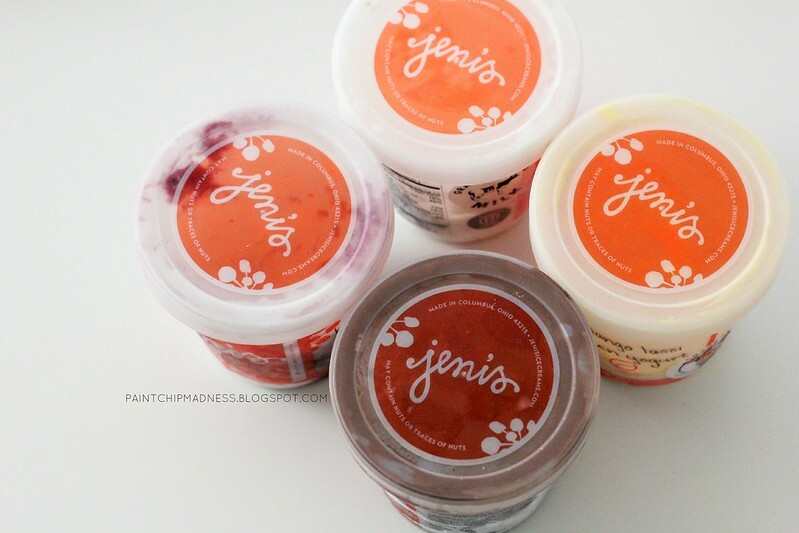 So have you ever tried Jeni's before? Depending on where you live, shipping can get a litle spendy, but it really is worth the extra few bucks. Especially with flavors like this one! p.s. I wasn't paid or compensated for this post. 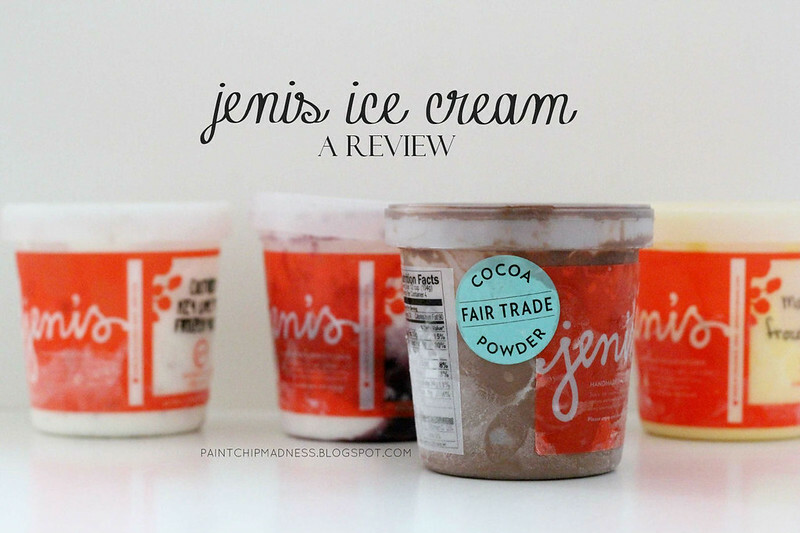 I just really love sharing good stuff and Jeni's is no exception. Uh. Dark Chocolate. Yes please?!!!! And that's so cool! I didn't know you could ship ice cream!! Uhm....ice cream in the mail!? Yessss. I'm not a huge fan of icecream, but this looks amazing. The dark chocolate is calling my name! oh my goodness, i can't wait to try this stuff! girl how could you normally stray away from chocolate ice cream?!?! ahhh that looks like the best! i had no idea you could get it delivered to your door - but i'm sure i'll look into that this summer!! To be honest, I'm actually not a huge fan of chocolate! I didn't actually start eating chocolate until middle school I think and even now, I'll only eat a little here and there (but dark chocolate is the BEST). And it's a lot of fun to get it to your doorstep! I love getting packages in the mail and it made for a great way to surprise my parents for their anniversary. This stuff looks so good! :) I actually found a place that sells it here in Michigan, crazy! The dark chocolate looks amazing! And the salted caramel, that looks good too. I'm all for getting ice cream in the mail! How could you stay away from chocolate ice cream?? Ooh, you should try it out! It's funny that you mention that they sell it in Michigan because shortly after I ordered it, I discovered that a few stores near me sell it, too. I'm glad to hear it's a thumbs up!!! I've always wanted to order from them. :) What books are you talking about - are they recipe books or something? It is most definitely a thumb's up company! It's a little spendy shipping-wise, but it's worth it (especially for a special occasion!). :) I'm already excited to see what this summer's seasonal flavors will be and hope to order again soon. You'll have to let me know if you order from them! And they do have recipe books! I think they actually have two out right now. One is for ice cream recipes and I think the other is a dessert book that uses their ice cream (or something like that). I thought they might, but it doesn't look like they do right now. :( Maybe check to see if they sell it in stores near you? Oooh I just went to a Jeni's store in Columbus last week! It was my first time trying it and it was SO good. 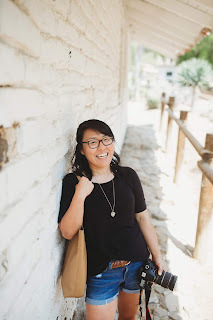 I got the dark chocolate – definitely a favorite! That's so cool! I completely forgot that you live in Columbus. :) And the PNW is most definitely enjoying the ice cream and I'll be thinking of you the next time I order it! I'll have to try the Savannah Buttermint flavor next, I think! I wanted to pick flavors that my whole family would like, but I've heard that one is a really popular one so maybe that will be the next one!